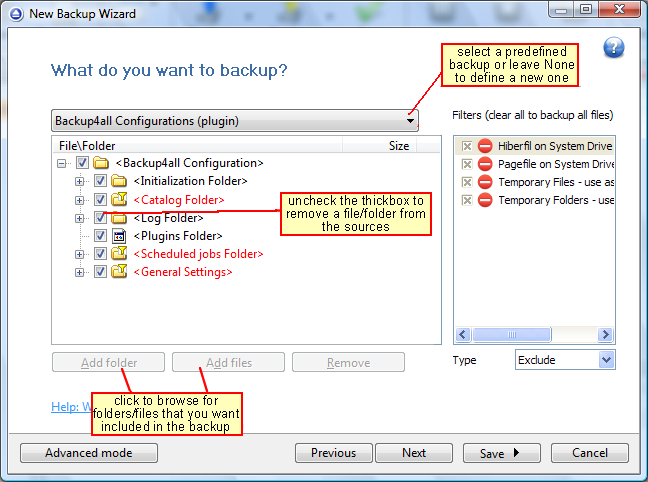 To create a new backup job, click on the New Backup Wizard toolbar button. For each backup job you must specify at least its name, a valid storage destination and the source files (first two steps of this wizard), the rest of the options not being mandatory. 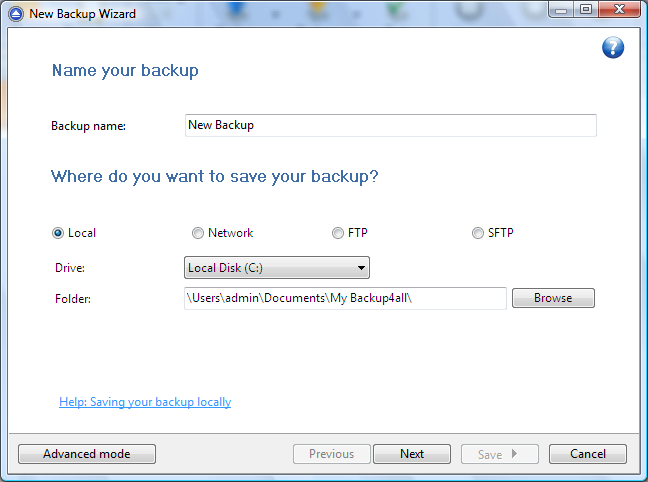 In New Backup Wizard, you can switch anytime to Advanced mode for more configuration options. 2) Select the files and folders you want to backup (sources of the backup) or choose a predefined backup from the drop down list and click Next. 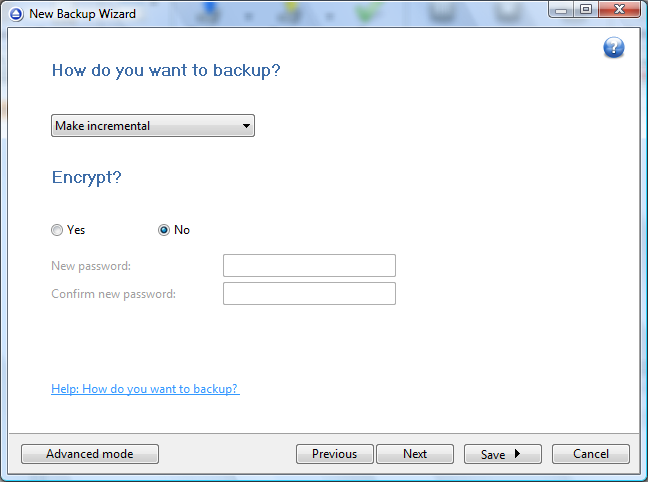 3) Select how do you want to backup. By default, the Make incremental option is selected. You can also use encryption for the backup types that creates zip files. 4) Choose when do you want to backup: how often, what day and what hour. Schedule the backup job for unattended backup executions. The wizard creates an ".ini" file in the IniFiles folder (usually in C:\\Documents and Settings\\<user>\\Application Data\\Softland\\Backup4all X\\) with the same name as the backup job. In addition, a backup catalog file (".bkc") is created both in the destination and locally in the BkcFiles folder (same directory where the IniFiles folder is created). Manually modifying ".bkc" or ".ini" files may result in corrupted backup jobs and the impossibility of restoring the data you backed up. A backup job is automatically created when double clicking on a ".bkc" file. You can also recreate the backup job by opening a ".bkc" or ".ini" file from the File -> Open Backup menu. 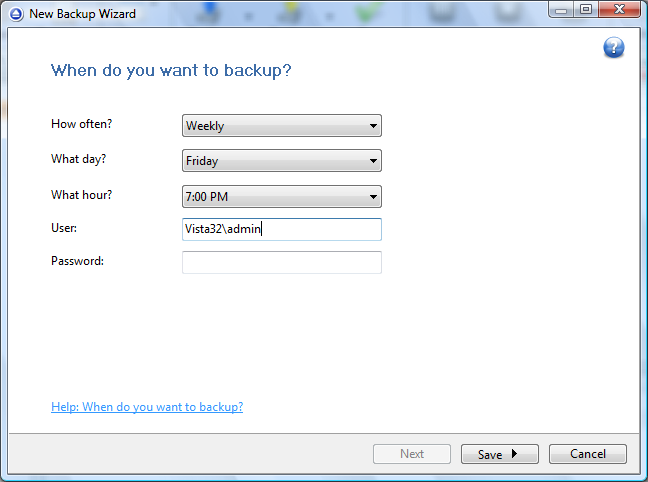 Once the backup job is created, it will be displayed on the left side of the application's main window. On the right, you will see the content of the backup job (files and folders), depending on the chosen view (brief, explore, backup, statistics or summary). This article explains how to configure backup jobs to run sequentially. A backup job (a tag or group of jobs) can be configured to run right after another backup job is finished. This article explains how to backup MS SQL Server data with Backup4all using a scheduled task. The database files are locked by the MS SQL Server. In order to backup these files and avoid data corruption, it is necessary to perform some actions.